This summer I'll be chronicling my attempt at getting my 5k PR down into the mid to low 16s. It's an ambitious goal but something that's deeply motivating as it will improve my running across all distances. Although trail running is far more enjoyable, there's something to be said for flat and fast - it feels good to knock out consistent splits, something that is impossible for me to achieve on rolling trails. There's also a formula for getting fast which isn't much of a secret either - run more, run faster, quality workouts. And it's HARD. Running fast or uptempo is hard on the body and mind. I'm fascinated by it all though, to see what I'm capable of and how consistent training will affect my race paces. And it all starts with the Redhook 5k for a baseline test of where I'm at. Heading into the race I had logged a little over three solid weeks of focused training. I thought this would be enough to get me into the sub 16s but it really just got me back to my previous PR at the Portland Waterfront 5k. Looking back on that fall, I had just come off a half marathon PR which included erratic but decent mileage. This summer I'll be working up to 80 mile weeks and the bumping volume heading into the race looked like this: 13, 38, 60, 64, and ultimately 65. My legs were taking a beating with base mileage AND workouts over the past few weeks and as race day was approaching I realized that it was going to be a wake up call. Hilary and I headed down to Portsmouth for the casual 11am start. This was great because we didn't have to leave until 8:45am and were able to sleep in a little. I'm not one for driving far for 5k's but this race had a deep field and a free beer / food at the end helped the cause. We also planned on heading over to Sunapee after the race to see Hilary's family so ultimately this was only an hour detour. I warmed up with Jim Johnson, Zac Switaj and Nick Aguila (all top finishers) by running the course. It seemed flat with a small climb halfway through but there was a stiff headwind on the first 0.7 miles. I got a few strides in before the start and took a spot behind Jim. There are ~2000 runners at this race but jockeying for a good starting spot wasn't an issue. We were started and in typical 5k fashion, the sprint was on. I was probably in 30th place out of the gates as to not get caught up in rush. 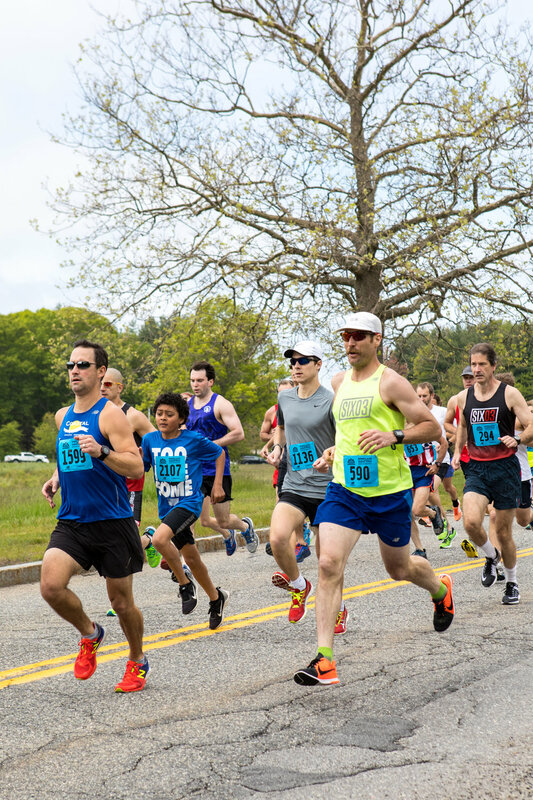 Well aware of my speed limitations, I capped my pace at 5:25 and once the excitement waned, found myself settling into an even pace pacing a few racers who went out hard in that first mile. I split mile one at 5:25 and thought that was where I wanted to be. I was passed by Chris Richie who was running very smooth and thought he'd be a good guy to latch onto. On the short climb we passed a couple more racers but our pace dropped to 5:35 and I thought that's fine, save some gas for the back half of the mile. We made a turn and the course has a slight descent so I tried to pick it up. I looked down at my watch to see that I was still running 5:30+ pace, not good. As we approached the second mile marker, the clock was ticking past 10:50 and I tried to pick it up to get under 11 minutes. The last mile was HARD. I was holding on with whatever speed I could find hoping that I had some kick left to finish strong. I definitely gave up some time on that last mile but made up for it was a strong kick on the final turn. At that point I closed in on the guy in front of me but couldn't pass him. Chris Richie had put on significant distance on me that last mile. I came through the finish at 17:08 which was disappointing but also a PR since I hadn't run a legit 5k course yet. I cooled off with another lap on the course and cashed in on the free beer and food. An added bonus was placing 2nd in my age group which was a surprise. My training hasn't kicked in yet. Just a few weeks of training has left me flat and adjusting to the work load. Six weeks is usually when you start to see the results so I think that my potential will start to show come late June or July. While I was a little disappointed with my time, I now have a pace to train off of and revised expectations for upcoming races. Sitting at my computer looking at times and numbers, it's easy to lose touch with how tough racing and workouts are. I'm up for it though and can't wait to see how consistent mileage will improve my results.